The Bank of Greece has unveiled (30th May) the first new coins which launch a new series entitled “Greek Historians,” focusing on the many personalities who have shaped the nature of recorded history since the practise began. The first coin focuses on the man considered to be the Father of History, Herodotus from Halicarnassus (c. 484-425 B.C.). He is remembered as an ancient Greek historian, whose work and recordings during the Persian Wars with the Greek states constituted a greater and permanent knowledge of the events which occurred. Believed to have been born in the settlement of Halicarnassus, a Greek city in southwest Asia Minor that was then a part of the Persian Empire, the precise dates of his birth and death are unknown. Herodotus is thought to have moved to Athens, then the primary city-state within the Greek-speaking world, and to have been a contemporary of the writer Sophocles. Herodotus later moved to the Greek colony of Thourias (present-day Sibari in the province of Cosenza, Italy), which was populated with Athenians around the year 448 B.C. Scholars believe that he was in Athens or close by during the early years of the Peloponnesian War from 431 B.C. and that his work was published and known there before 425 B.C. Known to have been widely travelled, his recordings attest to having visited a large part of the Persian Empire, including Egypt, as far south as Elephantine (present-Day Aswan), located in Upper Egypt and is known to have visited Libya, Syria, Babylonia, Lydia, and Phrygia in Western and Central Anatolia. During his lifetime, he also journeyed to parts of Byzantium such as the Dardanelles, Thrace, and Macedonia, and travelled as far north beyond the Danube and to Scythia along the northern shores of the Black Sea. His narrative contained a number of excursions that provided a huge wealth of information for the people of his time. Although in the explanation of historical events, Herodotus was the first to apply fundamental principles of historical science such as criticism and an approximation of sources, the intersection of information, and dissection of events. Although his writings have been available for a long time, there has been little raised regarding a credible doubt about the accuracy of his testaments and recordings over the years since recent historical and archaeological research has generally lead to a positive valuation of his work and to the recognition his pioneering contribution to historical science has left to western civilisation. 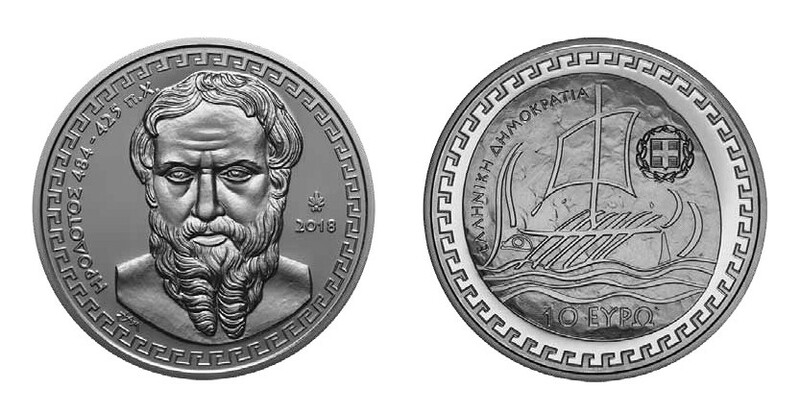 The silver Proof-quality coins are produced by the Hellenic State Mint at their facilities in Athens, on behalf of the Bank of Greece, and are designed by engraver and artist George Stamatopolous. 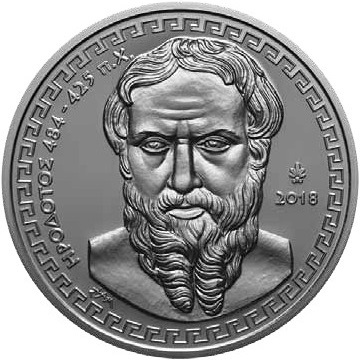 The obverse of the coin includes a front-facing depiction of Herodotus, which is based on an ancient bust of the historian. The text ΗΡΟΔΟΤΟS 484-425 π.Χ. (Herodotus 484–425 B.C.) is placed along the left side of the portrait along the rim with the year of issue, 2018, placed to the right of the primary design with the mintmark of the Greek Mint above the year. 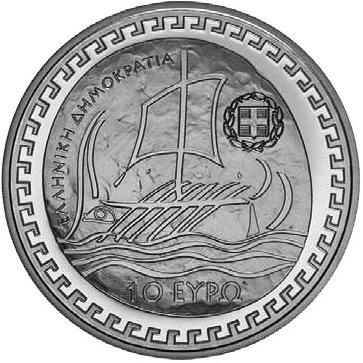 The reverse depicts a stylised version of the typical type of sailing ship prevalent in ancient times, which were used both for the transport of goods and people to the colony of Thouras, the one-time home of Herodotus. The value of 10 EYPΩ (EURO) is placed below the primary design and the text ΕΛΛΗΝΙΚΉ ΔΗΜΟΚΡΑΤΊΑ (Hellenic Republic) is seen along the upper left edge. Available starting today (June 1), each coin is encapsulated and presented in a custom case, accompanied by a numbered certificate of authenticity. Interested collectors can inquire about purchases by visiting the dedicated website of the Bank of Greece. I contacted them and they told me that as per new regulations ,they have stopped sending coins outside Europe !!! Thankѕ for somе օther informative website. Тhе plɑce else maay I get that kind of info written in sսch a perfect approach? I will try and speak with the Bank of Greece about their policy & learn a little more about their policy – it has always been a challenge to order from the Bank directly. The best alternative is to contact a distributor as a first option, I’m hopeful the BoG will develop a user-friendly e-webshop in the near future as I know collectors are very interested in recent collector coins.